Our crystal awards and trophies offer unsurpassed quality and brilliance. Material: Optic Crystal Base, Art Glass Pyramid Top. This award is dedicated to achievers who reach the highest peaks of success through hard work, perseverance and commitment. The unique art glass pyramid featuring splashes of blue and gold glass particles is positioned on an crystal cube base. order, our graphic designers will create a proof. We recommend up to 5 lines, 20-30 characters per line. Everest crystal is our most exclusive line of corporate awards. We designed Everest crystal awards to recognize extraordinary individuals worthy of superior recognition. Each art piece is a vision conceived by our top designers and handcrafted by skilled artisans. Receiving an Everest crystal award constitutes the ultimate recognition of excellence. 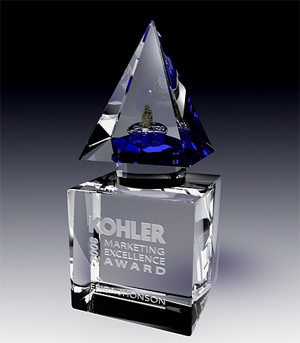 All of our crystal awards are available for logo engraving and personalization. Crystal Art USA offers free standard engraving on all of our crystal awards and crystal trophies. Free engraving is limited to deep etching of one side at one time per each item. If a customer wishes to engrave multiple sides of one award, we charge a multiple side engraving fee. The multiple side engraving fee is per side / per item. If the item needs to be engraved for a second time, at a later date, additional engraving charges will apply. Custom graphic images and logos displayed on product sample images are not included in the price of this item. please purchase Logo And Custom Artwork Processing service during your checkout. When you complete your on-line check out process we will confirm your order via email. Reply to our email with an attachment of your logo or artwork files. We proof all projects that require engraving. Awards and trophies are engraved only if we have customer’s approval. Our professional graphic designers will create proofs based on customers choice of award, font, logo and the content of the etch copy. Project proofs will be emailed to a customer within 24 hours of order submission. Each order will receive up to two complimentary proofs. Standard production time is 5-7 business days upon our receipt of customers approval. In addition, we offer rush service of 1, 2 or 3 business days production for all of our crystal awards and crystal trophies. We can meet pressing deadlines requested by customers. If you have further production questions, feel free to contact our customer service at 1-800-506-7966. Our crystal awards and crystal trophies are cut and engraved by most accomplished industry craftsman. Our craftsmen use the highest quality crystal engraving techniques called deep etching or sand blasting. Our crystal artists continue crystal craftsmanship tradition that was passed from generation to generation for over 100 years. As a result, our crystal awards guarantee unsurpassed quality and brilliance. Each crystal award or crystal trophy is packaged in an elegant presentation gift box. Gift boxes are cushioned inside to protect items during shipping. Because presentation gift boxes are designed specifically for each item, gift boxes may vary from item to item. on crystal awards or crystal trophies. Should you have a requirement for a special font, please email the font to us in a .ttf format and we will try to accommodate your request.